Take a trip and fly in style with our business class flights to Delhi. Our team of travel specialists will customise a perfect itinerary to suit your needs. With us it’s all about providing a first class service at an affordable price! Whether you are travelling for leisure or on business, we love to create and maintain long lasting relationships with you or your company. Whatever is required, we can include fantastic accommodation, car hire, transfers, and parking, with your flights to Delhi. Enquire now and let us take the stress out of finding the best value business flights to Delhi. Stretched out along the Yamuna River, the district of Old Delhi is rich in history and architecture, mostly pertaining to the Mughal Emperors . Containing some of the most visited sites in the capital, this area is teeming with culture and life. This historic area of the city Includes the famous Red Fort, an impressive monument built in 1638 that is still used today for official celebrations; the largest mosque in India, Jama Masjid; and the most hectic and chaotic street market in the city, Chawri Bazar. 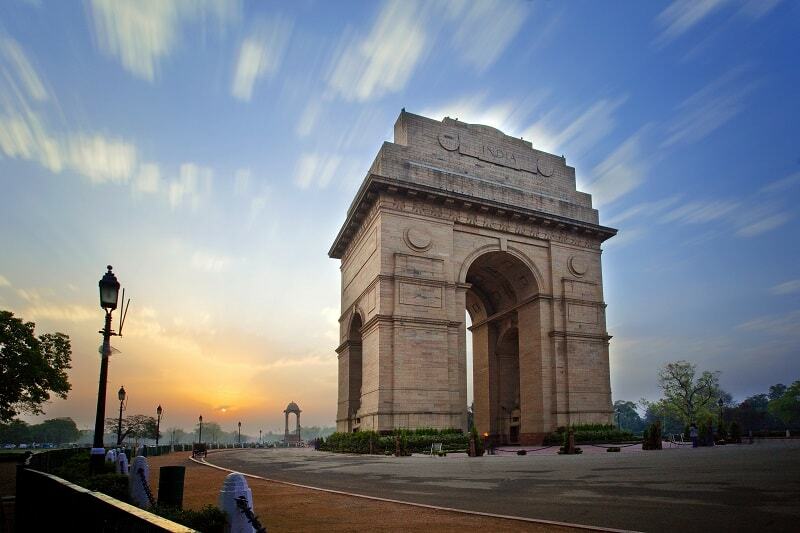 Outside of Old Delhi, New Delhi sprawls in all directions with attractions dotted throughout. A short distance to the south lies the imposing arch of India Gate, dedicated to the Indian nationals who lost their lives in the First World War. 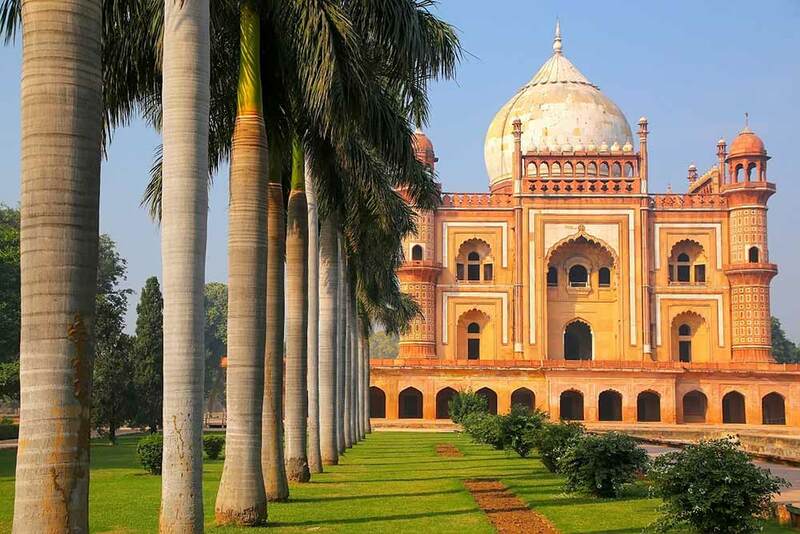 Further south, Humayun’s Tomb built in 1570 shows the design that inspired the Taj Mahal in years to come. Set in beautiful gardens and surrounded by a larger complex of buildings, it offers an excellent escape from the city’s bustle. Insider’s Tip: Hire a guide with a car for the day to take you to the sights outside the Old City as they can far between. A good option will include Akshardham, Humayun’s Tomb, and Lodi Gardens. Immerse yourself in the chaos of Delhi’s streets, savouring the sights, smells, and tastes on a walking tour of the Old City. 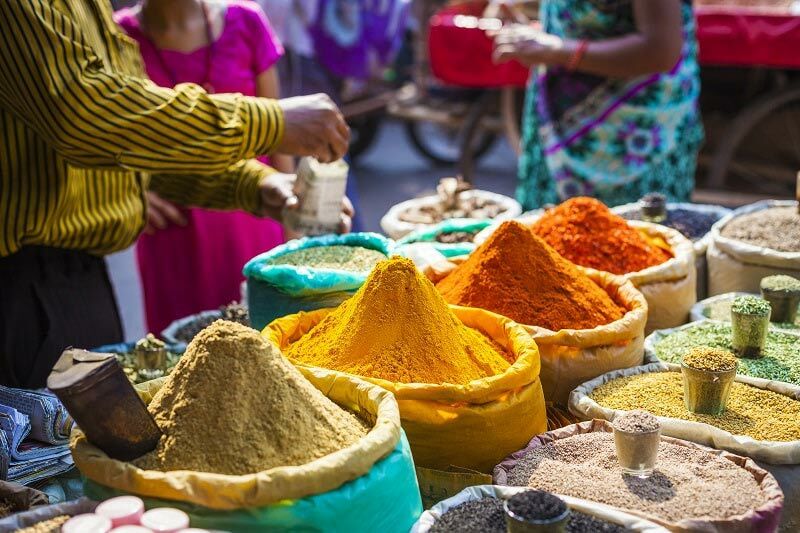 Take in the spice and fabric markets, the street food stalls, or the temples and history; whichever you decide, the atmosphere is sure to delight! Insider’s Tip: Give back to the local community and have a former street kid as your guide through the Salaam Baalak Trust. It provides a unique insight into the unseen side of city life that is fascinating! Situated in a slightly inconvenient location but well worth the effort is the UNESCO World Heritage Listed Qutub Minar, a 73 metre tall minaret. The tallest minaret in India and the tallest brick minaret in the world, the structure is covered in intricate carvings. Built originally in the 11th Century, it stands over the city as an icon, surrounded by monuments of the era. Close by, the even older Iron Pillar of Delhi is often remarked upon by historians, archaeologists, and scientists alike, and although not immediately a spectacle, have a think of what most iron objects look like after over 1600 years exposed to the air! Located conveniently between Connaught Place and India gate, the Shangri-La Eros Hotel is perfectly situated for all your business needs. 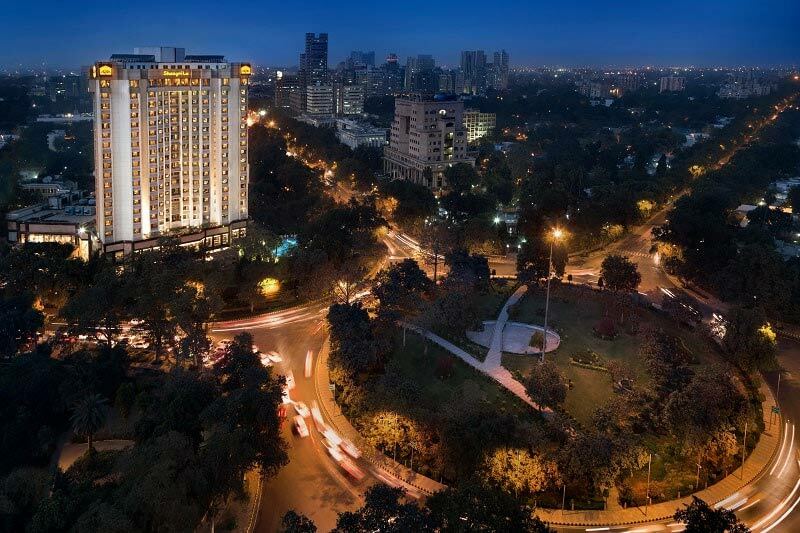 The Taj Palace Hotel is an icon of the Delhi accommodation scene, conveniently located in the Diplomatic Precinct to the southwest of the city centre. At around 250 kilometres south east of the capital, Agra is the country’s biggest tourist attraction. Although the crowds can be horrendous, and the touts will heckle you the entire time you are there, holidays to Delhi would be incomplete without seeing the Taj Mahal. Aside from this amazing mausoleum, the city also provides visitors the Agra Fort, a beautiful red sandstone complex in the city centre. Nicknamed the “Pink City” for its use of the red sandstone in its buildings, the best examples of this is at Palace of the Wind – Hawa Mahal, and the Amer Palace and Fort. Find out the reason for the intricate façade, or take a ride to the hilltop fort and marvel at the lovely gardens and buildings of the Rajasthan region. In the late afternoon, a trip to Sagar Lake for the setting sun over the Jal Mahal Palace is the perfect way to finish a day of sightseeing! 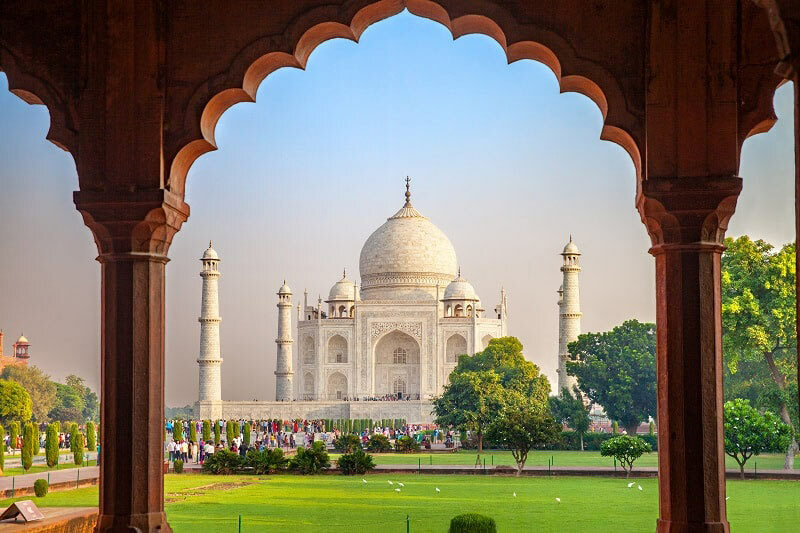 Delhi is well connected to the United Kingdom with direct flights, but why not include a stopover with your Indian holiday in Dubai flying with Emirates, Abu Dhabi with Etihad, or add a luxury island retreat on to the end in The Maldives!